NIA-CHARLESTOWN NEVIS (August 23, 2011) — Two young ladies were announced as winners of the first Nevis Island Administration/Medical University of the Americas (NIA/MUA) Health Science Scholarship. Ms. Kamara Louisy and Ms. Earline Pemberton were announced as winners on Monday, at a ceremony held at the Ministry of Finance Conference Room on Monday. 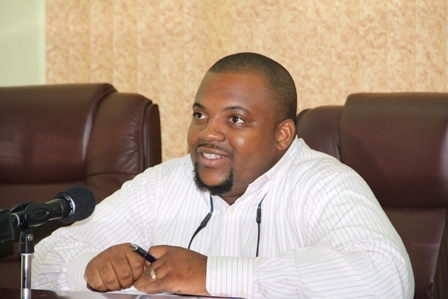 While he made the announcement, Committee Member Mr. Ron Daniel on behalf of HOPE Nevis Incorporated disclosed that a total of seven applicants responded to the call for the NIA/MUA Health Science Scholarship from May 30th to June 29, 2011. According to Mr. Daniel, the Committee was established by the Ministry of Health to include the Permanent Secretary in the Department of Human Resources Mr. Chesley Manners, the Principal Education Officer Mrs. Lornett Queeley Connor, Health planner in the Ministry of Health Mrs. Nicole Slack Liburd, MUA representative Mr. Steve Rodger and representative from the Private Sector Manager of FINCO Nevis and Director of TDC Ltd. Nevis Ms. Keesha Jones. He explained that the Committee’s role was threefold – to set a criteria for prospective applicants, to attract as many applicants as possible and to decide on the two best applicants. The criteria for the scholarships included Academic accomplishments, community involvement; references one academic and one otherwise; an essay why the applicant wanted to enter the particular field of study and priority areas for the needs of Nevis. Mr. Daniel also spoke to the types of applications received by the Committee, all of whom had been accepted by a recognised learning institution. 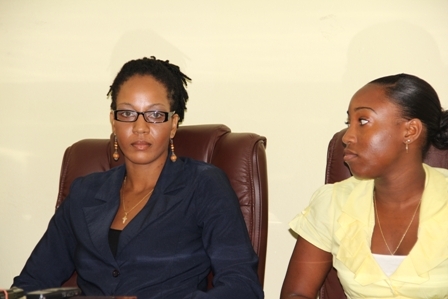 “After careful debate and deliberation, Ms. Earline Pemberton and Ms. Kamara Lousy would be studying to become a medical doctor at the UWI and Veterinary medicine at St. Matthews University School of Veterinary Medicine were chosen based on the fact that those two best represented the specifics of the criteria and fit uniquely into the human resource needs of the island,” he said. The NIA/MUA Health Science Scholarships were offered in an effort to encourage the pursuit of tertiary education in Medicine, Health and the Sciences. Two scholarships will be offered on an annual basis to deserving high school graduates with a sound academic record. The scholarship will afford the awardees the opportunity to study up to four years at the Medical University of the Americas, the University of the West Indies or at any four year United States based institution.